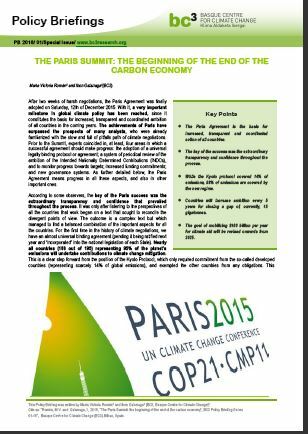 The Paris Summit: the beginning of the end of the carbon economy. -The Paris Agreement is the basis for increased, transparent and coordinated action of all countries. -The key of the success was the extraordinary transparency and confidence throughout the process. – While the Kyoto protocol covered 14% of emissions, 98% of emissions are covered by the new regime. -Countries will increase ambition every 5 years for closing a gap of, currently, 15 gigatonnes. -The goal of mobilizing $100 billion per year for climate aid will be revised onwards from 2025.